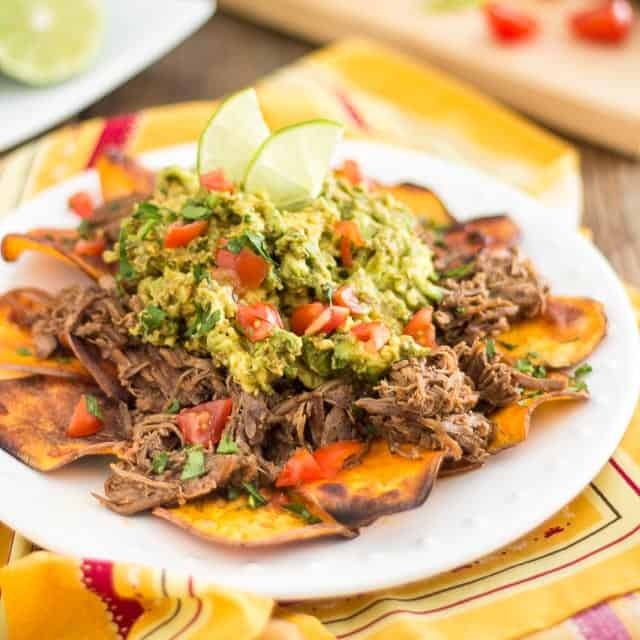 I chose to call these Lamb Barbacoa Nachos, for lack of a better name, but frankly, I’m not sure that they really have much at all to do with nachos. Sure, there are a few similarities with the popular Mexican dish… but in my mind, nachos are like a humongous pile of crunchy tortilla chips topped with LOADS of stuff like spicy ground beef, firey hot tomato salsa, sliced olives, black beans, fresh tomatoes, finely chopped jalapeno peppers and LOADS of melted Monterrey Jack cheese. 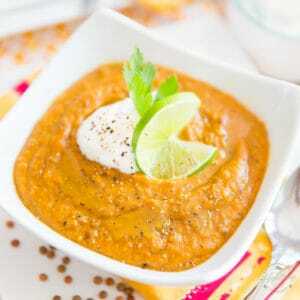 Typically, they are served with a generous amount of sour cream and more firey hot tomato salsa. 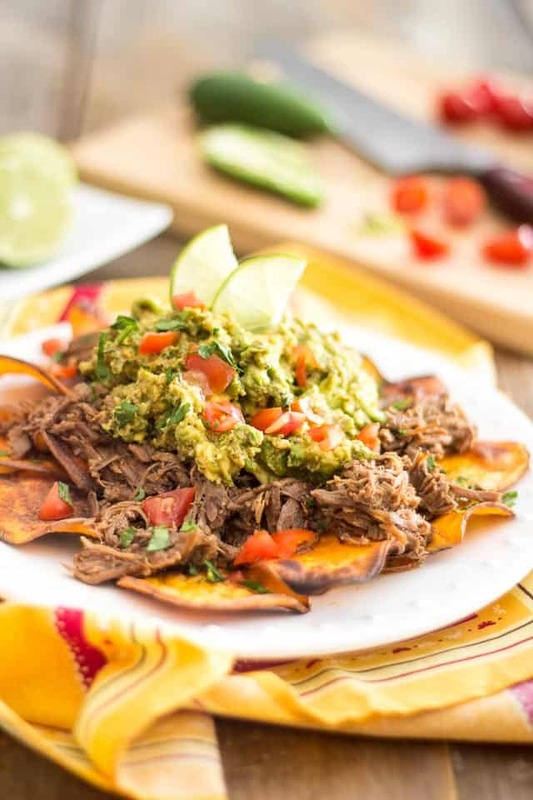 Nachos are something that I’ve always considered to be a major treat, junk food at its best; but now that I think of it, I see that this old favorite of mine could very easily be turned into a healthy eating experience. But this course I’m offering today does not exactly deserve to be referred to as nachos. Rather, this is a very simple dish that I created out of necessity. 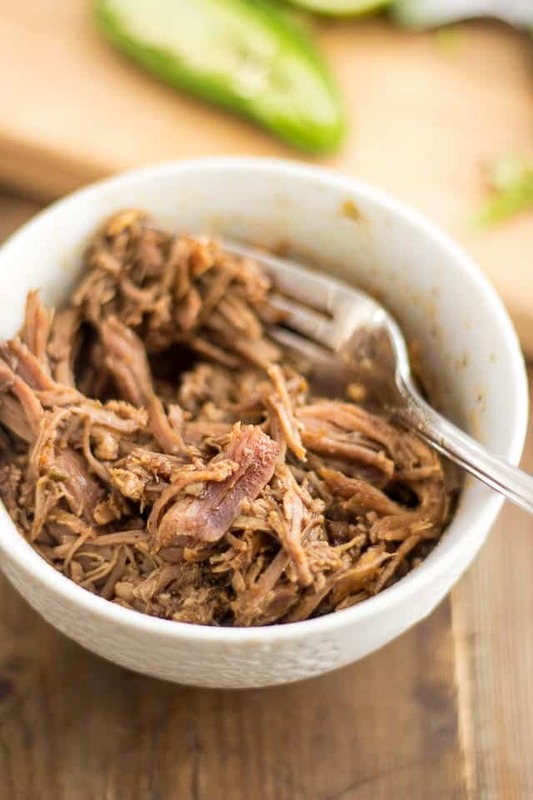 You see, I’d just whipped up a giant batch of this delicious Lamb Barbacoa and needed to come up with a creative way to use the leftovers. 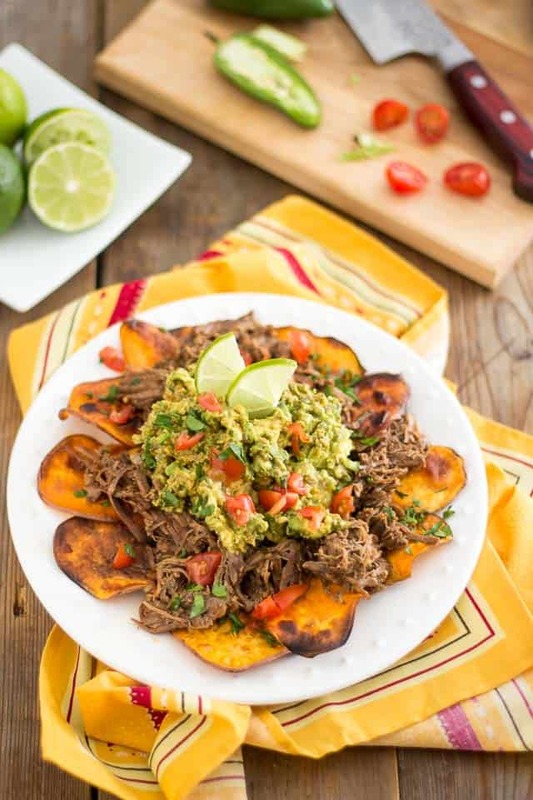 I kind of caught a mental glimpse of a picture that I had come across a while ago, and it inspired me to lay some of that beautiful meat over a bed sweet potato slices, pan-fried to crispy perfection, and top it with a quick and easy guacamole. The result was nothing short of spectacular. If you want your potatoes to get really nice and crispy, you need to slice them really thinly. For that, I strongly suggest that you use a mandolin. There’s simply no way that you will succeed at getting slices that thin with a regular knife, no matter how sharp your blade or how skilled you are. 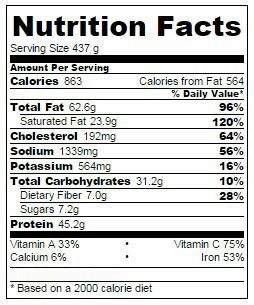 You will need to cut about 16 to 18 slices out of a large sweet potato. Then, arrange them on a plate, cover with plastic film and cook them in the microwave on high for 3 minutes. Melt some ghee in a large non-stick pan set over medium heat. 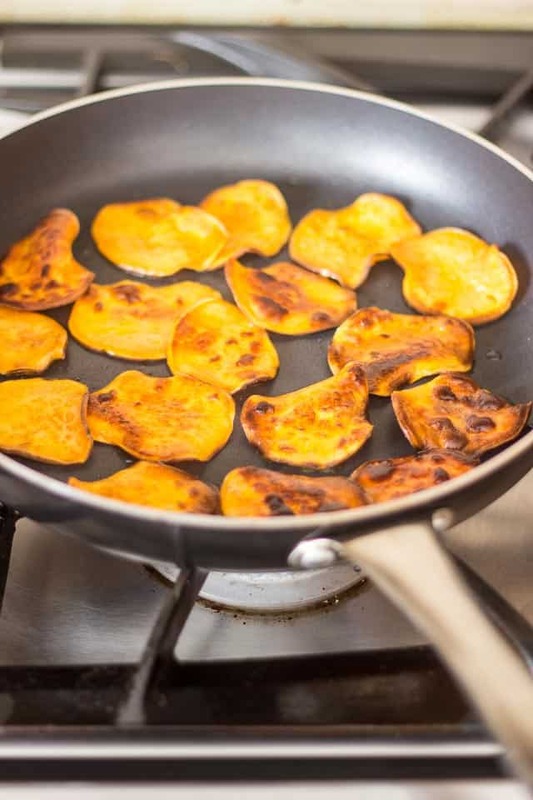 When the pan is hot enough, add the sweet potato slices, sprinkle with salt and cook until they take a nice golden / brown coloration and start to get crispy, about 2 to 3 minutes. Flip the slices one by one and repeat the process on the other side. Kill the heat and reserve. While the potatoes are cooking, reheat the lamb in the microwave or in a small saucepan set over medium heat. Now, if you didn’t have any of that delicious Lamb Barbacoa in the fridge, don’t fret. 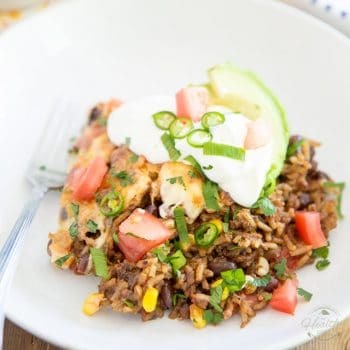 You could very well use some of the ground beef from this Warm Taco Salad recipe, or even go with any leftover pulled meat you may have in your fridge. Simply add a few pinches of cumin and chili powder to it and you’ll be good to go! 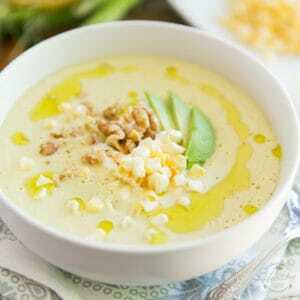 Next, put the avocado, jalapeno pepper, spices and lime juice into a small mixing bowl and mash coarsely with a fork. Then, mix delicately until the ingredients are well combined. Resist the urge to eat them all right this instant. I know they are looking good, but things are about to get even better! Top with the warmed meat and creamy guacamole. Garnish with chopped tomatoes and parsley and squirt with a little bit more lime juice, if desired. Now you can dig in!!! And if you think you’re gonna need a knife and fork to eat this because it’ll be a pile of mushy mess, I’ve got news for you: just you look at that! I told you those sweet potatoes got REALLY crispy! So much so, they can hold this entire mound of goodness, without so much as bending. No fork needed here! And talk about a fantastic texture.They seem to explode into hundreds of little pieces when you bite into them. 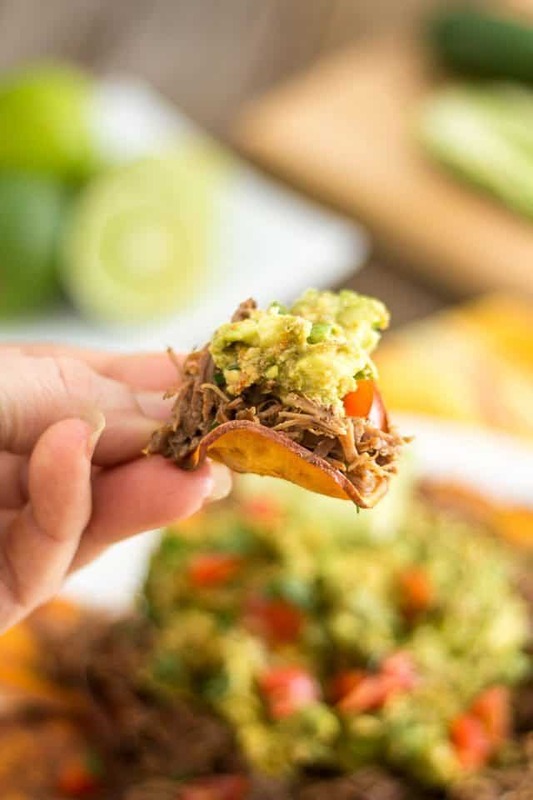 Their crunchiness, combined with the juiciness of the meat and creaminess of the guacamole creates some kind of crazy fiesta in your mouth, one that you wish would never ever come to an end. Quite frankly, this was an outstanding dish and I know I’ll be having it often. Still, I can’t wait to experiment with making “real” paleo nachos. 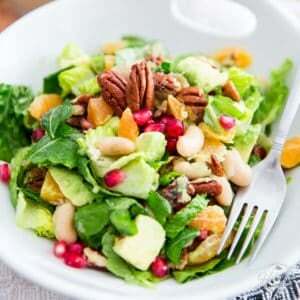 I am so adding that to my list of dishes to make when my Whole30® is be over! Because yeah, what I have in mind would totally qualify as SWYPO and I think I may even include a little bit, or a lot, of cheese! With the help of a mandolin, slice the sweet potato as thinly as possible, then arrange them on a plate, cover with plastic film and microwave on high for 3 minutes. Melt the ghee in a large non-stick pan set over medium heat. 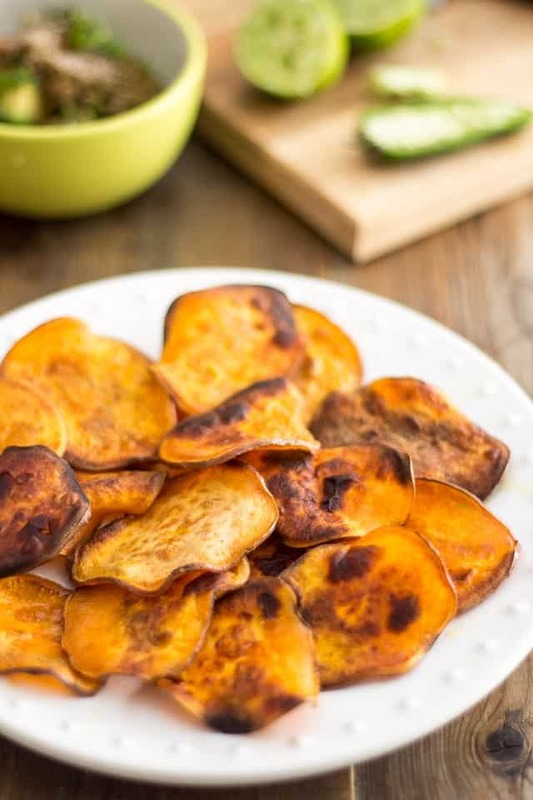 When the pan is hot enough, add the sweet potato slices, sprinkle with salt and cook until they take a nice golden / brown coloration and start to get crispy, about 2-3 minutes. Flip the slices one by one and repeat the process on the other side. Kill the heat and reserve. 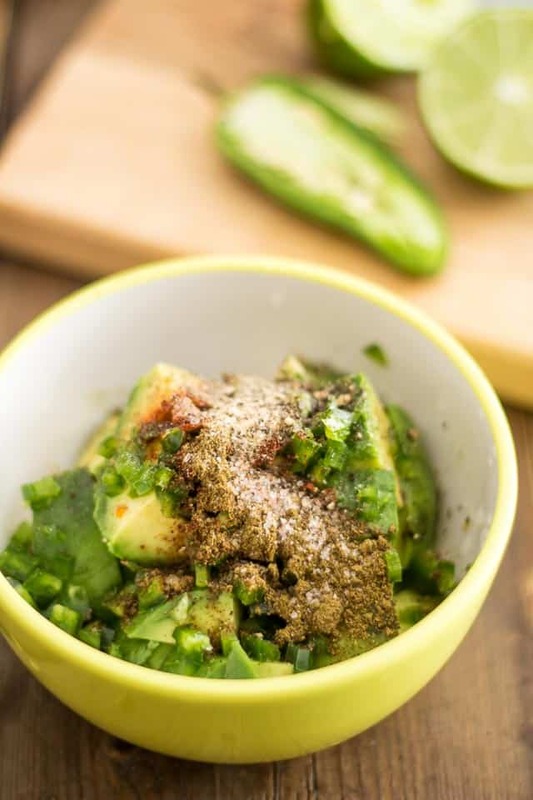 Add all the ingredients for the guacamole to a small mixing bowl and mash coarsely with a fork, then mix until the ingredients are well combined. 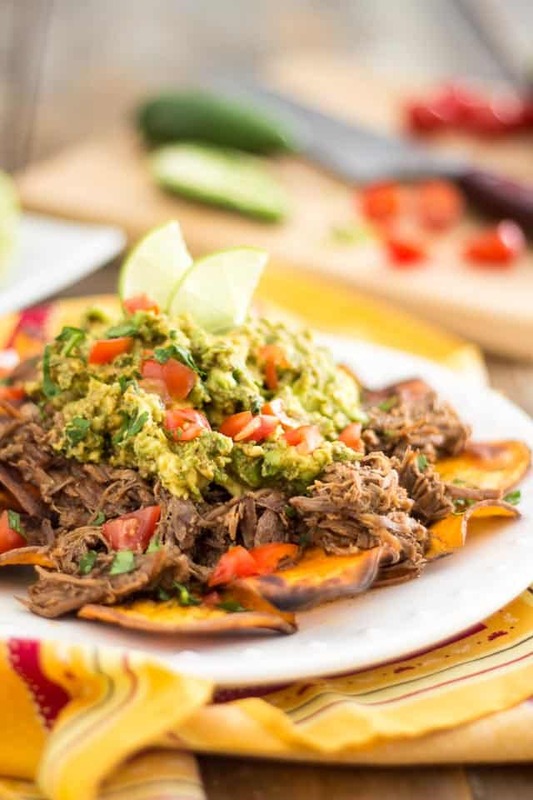 Arrange the potato slices on a plate, top with warm meat, followed by guacamole. 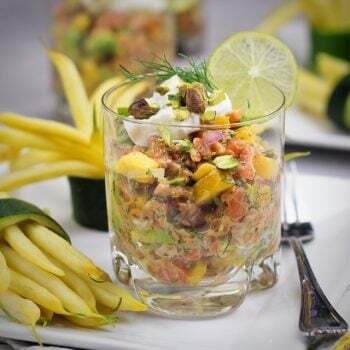 Garnish with chopped tomatoes and parsley and more lime juice, if desired. Wow, that looks amazing, such an awesome idea! I just wanted to let you know, I have printed out your last five recipes and plan on making them over the next week. 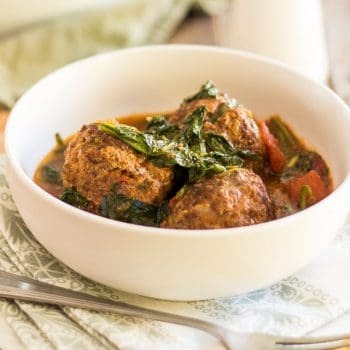 I have been following your blog for a few years and make things occasionally but these Whole 30 recipes are fantastic (and fit more into our everyday diet). Thank you for making dinner so exciting. 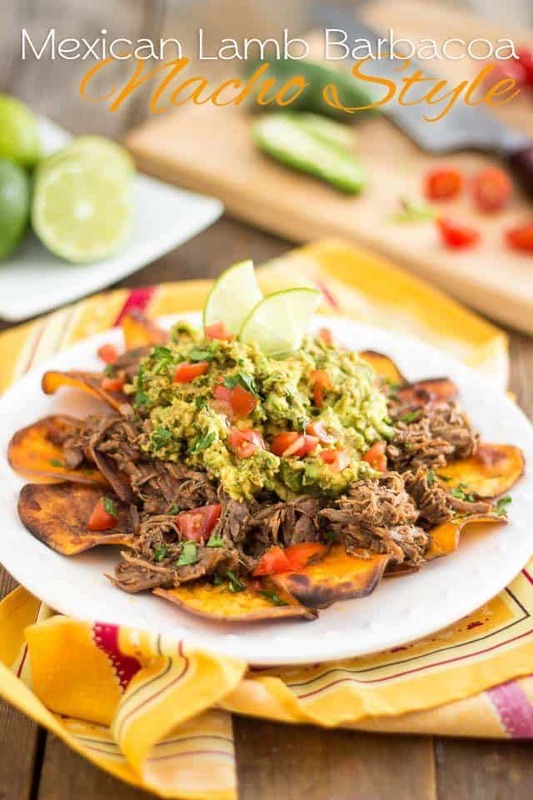 I love the idea of using crispy sweet potatoes instead of tortilla chips…such a healthier (and arguably more delicious) way to enjoy the classic flavours of Nachos! 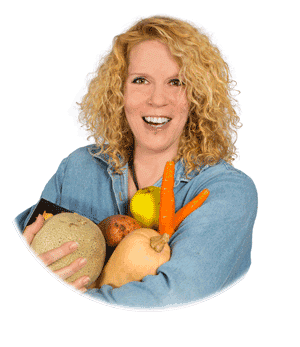 I’m planning to start another Whole 30 soon so I’m excited to see you posting a bunch of new Whole 30 compliant recipes! 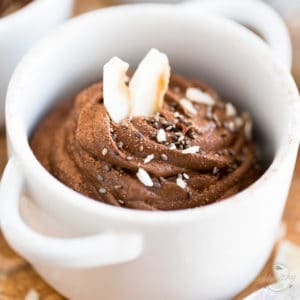 I’d eat the heck out of this even if I WASN’T on the Whole 30, but I will definitely be making this one soon and save it for week 2 which is always the hardest for me for some reason! Yay! Good for you! When do you start? And I’m curious… what is it that you find especially hard when you hit the second week? 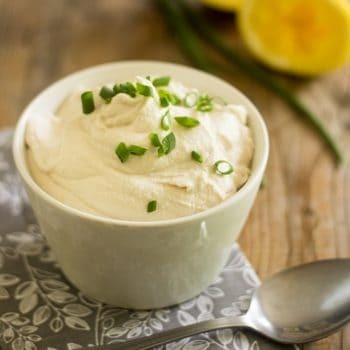 Do you think this could work with butternut squash? I’m doing SCD so I can’t have sweet potatoes. Honestly, I don’t think so, Sarah. Well, I don’t think the squash will get that crispy, anyway. It’s worth a try, though. I’m sure it’ll result into something succulent, nonetheless!